PagerDuty is is an operations performance platform created to improve the reliability and performance of businesses by eliminating the chaos across the entire operations lifecycle. PagerDuty gives IT and development operation teams powerful capabilities including alert monitoring, on-call scheduling, escalation policies and incident monitoring to resolve problems in their apps, servers and websites. 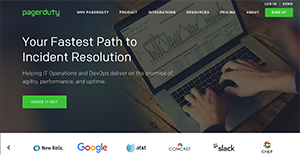 PagerDuty enables DevOps teams to deliver high-performing apps and delightful customer experiences. With real-time alerts and visibility into critical systems and applications, operations teams can quickly detect, triage, and resolve incidents from development through production. With hundreds of native integrations with operations tools, automated scheduling, advance reporting, and guaranteed availability, PagerDuty is trusted by over 7,000 organizations globally to increase business and employee efficiency. Powered by machine learning, the software effectively makes the right information accessible to you. It can help you work smarter thanks to operations health analytics, industry benchmarking, and seamless automation. Incident management solution PagerDuty is an agile tool that is aimed at keeping real-time operations at optimum levels through the use of streamlined incident resolution methods. PagerDuty enriches and aggregates events and then correlates them, turning those events into actionable alerts. The system then accelerates and smoothens the incident management lifecycle by reducing noise and resolution times. PagerDuty is a very popular tool, mainly because it is an alerting application that is simple, user-friendly and integrates well with other business systems and applications. The system is implemented in lots of countries and has scheduling that enables for follow-the-sun ops teams to thrive. PagerDuty enables users to set up and prioritize alerts for the whole team, providing them with SMS and voice messages capability on top of standard email alerts. And if the system detects that a team member is not responding, it can be set to escalate the alerts automatically. For instance, if a team member doesn’t reply to an email in a timely manner, the system would then send an SMS notification a few minutes later, and so on. Another alternative is to send notifications to team members if someone isn’t responding. The service also lets you configure and deploy on-duty calendars, enabling you to alternate who you want to notify first depending on the date and schedule of other members of the team. Overall, PagerDuty streamlines the management of your entire lifecycle, especially when it comes to dealing with connections and communications. It connects with over 300 third-party system for you to gain end-to-end visibility of your workflows. In collaborating with your team, its on-call management solution strengthen accountability for your team. Furthermore, modern incident response is available for the most critical incidents to receive the best and most effective response through automated precision response, incident priority and stakeholder communication. Every business has its own characteristics, and may require a specific IT Management Software solution that will be designed for their company size, type of customers and employees and even specific industry they cater to. We advise you don't count on finding an ideal app that will work for each business regardless of their background is. It may be a good idea to read a few PagerDuty reviews first and even then you should pay attention to what the solution is supposed to do for your business and your staff. Do you need an easy and intuitive app with only basic functions? Will you really make use of the advanced functionalities required by pros and big enterprises? Are there any specific tools that are especially beneficial for the industry you operate in? If you ask yourself these questions it will be much easier to find a solid solution that will fit your budget. We realize that when you make a decision to buy IT Management Software it’s important not only to see how experts evaluate it in their reviews, but also to find out if the real people and companies that buy it are actually satisfied with the product. That’s why we’ve created our behavior-based Customer Satisfaction Algorithm™ that gathers customer reviews, comments and PagerDuty reviews across a wide range of social media sites. The data is then presented in an easy to digest form showing how many people had positive and negative experience with PagerDuty. With that information at hand you should be equipped to make an informed buying decision that you won’t regret. What are PagerDuty pricing details? What integrations are available for PagerDuty?